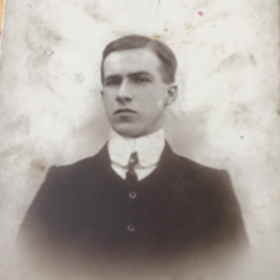 Thomas (Tom) BENTLEY was born at 24 Cambridge Street, Rugby on 16 June 1887, into a railway family. He was the son of Thomas Bentley, who was born in about 1861 in Stoke on Trent and Mary Jane, née Startin, Bentley, whose birth was registered in Market Bosworth in Q2 1861. They were married on 27 November 1882 at Saint Andrew’s church, Rugby. His father’s family came originally from Weston On Trent, Staffordshire, and whilst Thomas’s grandfather, also Thomas, had been a ‘boatman’ in 1851, it seems that he joined the railway soon afterwards and his changes of address and the birthplaces of his children show the progress of his career. In about 1861 the family were in Stafford and by about 1862 they had moved to Rugby. In 1871, Thomas’s grandfather was living with his family in King Street, Rugby, and he had been promoted to become a ‘Railway Engine Driver’. In 1881 the family lived at the, now numbered, 13 King Street, Rugby – possibly the same house – and grandfather Thomas was still an ‘engine driver’, and Thomas’s father, also Thomas and still living with his parents, was a ‘Rly Engine Fitter’, and his younger brother, John, was a ‘Rly Engine Cleaner’. In 1891 grandfather Thomas was still an ‘engine driver’ and still living at 13 King Street. His second son, John, had risen to be a ‘locomotive foreman’, and was now married and living next door to his parents at 12 King Street and he already had three young children. Meanwhile, towards the end of 1882, the eldest son, Thomas’s father, Thomas, had married with Mary Jane Startin, in Rugby. The family seem to have been moved to Birmingham from at least 1884 to 1886 as their two eldest daughters were born there. However, by 1887 they had moved back to Rugby and by 1891, Thomas junior, now three years old, and his family had moved to 26 Cambridge Street, Rugby. Thomas’s father was still a ‘fitter’, presumably still with the railway. In 1901, Thomas was 13, with five younger siblings, one a baby of two months. They were now living at 22 Worcester Street, Rugby, and Thomas’s father was an ‘engine fitter’. His two elder sisters, Annie and Mary, who would now have been 17 and 15, were no longer at home. They both married in the 1900s. By 1911 Thomas’s father had made a change of career and moved to run a ten room pub, ‘The Mug House Inn’, at 12 Severn Side North, in Bewdley, Worcestershire. Thomas and Mary Jane were now both 52 years old, and had been married 30 years; they had had eleven children, with ten of them still living. Five of Thomas’s siblings were also at home, and also in the house on census night were his father’s ‘granddaughter’ and a ‘sister-in-law’. Thomas married Frances Annie née Tolley, Bentley, who was born on 6 May 1890, in Bewdley. Her father was a ‘corn haulier’ and latterly a coal merchant of Ribbesford. In 1911 she was a cook for a widow, Elizabeth Kitching, who died in later 1912. Maybe she then moved to cook at the Inn or perhaps she had met Thomas earlier. They were married on 23 June 1913 in Kidderminster. The photograph of Thomas Bentley may have been taken on the occasion of his marriage. Thomas and Frances had a son, a fourth generation Thomas Bentley, who was born on 25 September 1915 in Kidderminster. Thomas Bentley was still working in Bewdley in 1916 and was probably ‘called up’ when conscription was extended to married men in May 1916. He enlisted in Worcester as a Private, No. 46066, in the Worcestershire Regiment, initially in the 1st Battalion. He was latterly in the 4th Battalion of the Worcestershire Regiment but as there is no date when Thomas went to France, he may have been sent to reinforce the 4th Bn. either before or after going to France when he was with the 1st Battalion. There would have been a period training before he went abroad, so it was probably in late 1916 or early 1917. In 1913, the 1st Battalion had been in Egypt, and on 16 October 1914 they arrived back in England – at Liverpool – and joined the 24th Brigade in the 8th Division. On 18 October, the 24th Brigade transferred from the 8th Division to the 23rd Division, and in November 1914 went to France and Flanders. In October 1915 they fought at Neuve Chapelle and Aubers Ridge and on 15 July 1916 the 24th Brigade transferred back to the 8th Division. In 1917 they fought at Bouchavesnes and Ypres, and in 1918 at Pargny, Rosieres and the Aisne. As noted, the date when Thomas transferred to the 4th Battalion is unknown, but it was probably after later 1916 when the Battalion had returned from Burma, spent time in Warwickshire and had then taken part in the landings and action at Gallipoli. They were then withdrawn via Egypt to France, landing at Marseilles on 20 March 1916. After the Gallipoli campaign the 4th Battalion were ordered to proceed to France. They disembarked at Marseilles on the morning of 20 March 1916. During July 1916 the 4th Battalion were involved in the attack on Beaumont Hamel. On the night of July 29/30 1916, the 4th Battalion moved forward by train to Ypres and were to remain in action for some 2 months before leaving again for the Somme (8 October 1916). By the spring of 1917 the 4th Battalion were involved in the battle of Arras. In July 1917 they were back in the Ypres Salient where they remained until mid October 1917. After the German Advance in their Spring Offensive, ‘Operation Michael’, in March 1918, the Allies continued to withdraw, until they were able to hold the advance which finally weakened the Germans and overextended their supply lines. Then in August 1918 the Allies fought back. During the early months of 1918, the 4th Battalion were active in the Lys and remained in that area until September. Their next main action was to be at Ypres were they were involved in the retaking of Gheluvelt. In October 1918 they saw action at the Battle of Courtrai and by November were marching to the Rhine. The War Diary for the 4th Bn. Worcestershire Regiment in France and Belgium is available on-line and runs from March 1916. It seems likely that Thomas Bentley was among the many drafts of reinforcements posted from UK – and probably from 1st Bn. reserves, to bring numbers up to strength. Some extracts from the Diary for October and the last two weeks of his life are given below. Oct. 2. – … the 2nd Hampshires succeeded in taking the village of Gheluwe, capturing a number of prisoners. … This Brigade was relieved … the relief was considerably delayed owing to the enemy counter-attacking … No ground was, however, lost. Oct. 3. – The Battalion moved back to Dirty Bucket Camp … it entrained on a light railway at 18.30 for Brake Camp, arriving there about 23.50. Oct. 4. – … Baths allotted to Companies. Men issued with winter underclothing. Jerkins and blankets were also received. Oct. 5. – The battalion was conveyed by lorries from Dirty Bucket Camp to Ypres. … Draft of 44 O.R. [Other Ranks] joined Battalion’. Oct. 6. – … moved … billets from the Infantry Barracks to shelters and cellars near the [Ypres] station. Oct. 10. – A quiet day. Artillery activity on both sides normal. … Capt. E C Bennet V.C., M.C., joined the Bn. for one month’s attachment. Oct. 11. – Our artillery put down a barrage … just before dawn. The enemy retaliated very heavily … Enemy artillery very active most of the day … the Battalion was relieved … a very wet night. Oct. 13. – The Battalion moved into assembly position with the remainder of the 29th Division, south-west of Ledeghem. Oct. 14. – At 05.55 the 29th Division … attacked the enemy, the final objective being the railway line running from Courtrai to Ghent … [a detailed half page description of a somewhat confused day of fighting followed] … Casualties from Zero hour … [One officer was killed, three wounded and one gassed] – 11 O.R. killed. 82 O.R. wounded. 28 O.R. missing. 5 O.R. Sick. 1 O.R. N.Y.D. (Gas). Thomas Bentley would have been one of those eleven men ‘Killed in Action’ on 14 October 1918, he was 31. He was buried in Plot: A.19., in the Ledeghem Military Cemetery which is located some 10 miles east of Ypres and which was captured by Thomas’s Division in the attack in which he was killed. When a gravestone replaced the temporary marker in about 1920, his widow added the inscription ‘Death divides but memory ever clings’. Less usually, he was buried together with another ‘unknown’ soldier. Thomas’s stone is thus additionally inscribed at the base, ‘Also an unknown Private of the Great War, Worcestershire Regiment, 16th October 1918, known unto God.’ There are two other graves of known 4th Bn. soldiers who were also killed on 14 October 1918, which are shared with an ‘unknown’ soldier killed on 16 October 1918. Ledeghem was almost captured on 19 October 1914 by the 10th Hussars, who were forced to retire the same day. It then remained in German hands for four years. On 1 October 1918, the 9th (Scottish) Division captured the village, but could not hold the whole of it; it was finally cleared by the 29th Division on 14 October. The church, the school and the civil hospital of Ledeghem were used by the Germans as hospitals, and in October 1914 to September 1918, they buried German and Commonwealth casualties in three cemeteries in the commune. Ledeghem Military Cemetery was made by the 29th Division (as ‘Ledeghem New Cemetery’) in October 1918. … The cemetery was designed by W H Cowlishaw. The action they were preparing to fight would be known as the Battle of Courtrai. The assault opened at first light on the 14 October with an intense British barrage. Unfortunately with the smoke shells combining with autumn mist formed an intense fog. The troops began to lose their sense of direction, and units of the 88th Brigade began to become confusingly mixed. They did, however, move effectively through the ruins of Ledeghem and surprised the German troops, capturing many machine guns and field guns. The advanced platoons reached the road from Barakken to Overheule. Here, the two battalions reorganized and consolidated, and the 2nd Hampshires moved through them to continue the advance, but were held up in the afternoon near Gulleghem. The 4th Worcesters spent the night in a support position north of the village of Moorseele. The next day saw the British armies advance to the outskirts of the major town of Courtrai, and the German armies fall back to the line of the river Lys. The action was typical of the period, with the British armies incurring heavy casualties, but liberating occupied Belgium and pushing the exhausted German army to the point of collapse. The fighting of 14 October cost the 4th Worcestershires 120 casualties: 2 officers killed, 3 wounded; 83 other ranks wounded and 11 killed: one of the dead was Private Thomas Bentley. Seven of Thomas Bentley’s colleagues from the 4th Bn., were also killed that day and are buried in the same row of graves, set against the boundary wall of the Ledeghem Military Cemetery. Thomas’s outstanding pay of £10-6-9d was paid to his widow, ‘Francis A’ in two instalments of £3-8-11d on 4 March 1919, and £6-17-10d on 11 April 1919, and his War Gratuity of £7 on 15 December 1919. Thomas was awarded the Victory and British medals – he is spelled incorrectly ‘Bently’ on his Medal Card – and he is remembered correctly as ‘Bentley T’ on the Rugby Memorial Gate. He is also remembered on the Bewdley War Memorial, which is part of the external east wall of St. Anne’s Church, and also on the war memorial at the Bewdley Institute, where Thomas was a member. After Thomas’s death, and probably before 1920, his widow, Frances, moved to 71, St. John’s, Worcester, where she ran a sweet-shop. She is listed there in 1924, 1928, and 1932, as a ‘Confectioner, Retail’. She died aged 44, in Worcester in 1933. Thomas and Frances’s son, Thomas had moved by 1939 to Oldbury, Worcestershire, where he had become a hairdresser like his father. He married Miriam F Potter in Horsham in Q4, 1941, and was still living there when he died aged 82 in 1997. This article on Thomas BENTLEY was researched and written for a Rugby Family History Group [RFHG] project, by John P H Frearson and is © John P H Frearson and the Rugby Family History Group, August 2018. The ‘Mug House’ still exists, it provides food and accommodation and is listed in the CAMRA Good Beer Guide. For a brief history see: http://www.mughousebewdley.co.uk/bar/a-brief-history-of-the-mug-house/. From research into Bewdley’s WWI casualties, undertaken by Simon Fielding – see also his posts at: https://www.greatwarforum.org/topic/231174-worcestershire-regiment-14-1018/. From the ‘potter Family Tree’, shared by ‘keithpotter70’ on 15 July 2016 on www.ancestry.co.uk. UK, WWI Service Medal and Award Rolls, 1914-1920 and information in answer to a query on the Great War Forum, see: https://www.greatwarforum.org/topic/231174-worcestershire-regiment-14-1018/. A fuller description of the Brigade’s time in Warwickshire, its parade near Dunchurch and review by the King and its campaign in Gallipoli is on line at http://www.worcestershireregiment.com/wr.php?main=inc/bat_4. UK, WWI War Diaries (France, Belgium and Germany), 1914-1920, Worcestershire Regiment, 29th Division, Piece 2309/2: 4 Battalion, Worcestershire Regiment, (1916 Mar – 1919 Apr). He was one of the officers wounded on 14 October 1918.in the attack when Thomas Bentley was killed. NYD : Not Yet Diagnosed. https://www.greatwarforum.org/topic/231174-worcestershire-regiment-14-1018/, Dr. Fielding was preparing biographies of the Bewdley casualties. His biography for Thomas Bentley was not found until this article was almost finished, but provided some useful additional details. The Bewdley Institute memorial plaque lists eight members of the Institute who died in the Great War – see: https://www.greatwarforum.org/topic/231174-worcestershire-regiment-14-1018/. Kelly, Directory of Worcestershire, 1924, 1928, 1932. Much information has been edited from a family tree, posted by ‘keithpotter70’ at Ancestry.co.uk. This entry was posted in Uncategorized and tagged 1918, Bentley, Bewdley, Worcestershire Regiment by Christine. Bookmark the permalink.